On 1 July 2019, the current 4.77% SRV expires. An estimated 2.7% rate peg would be added to the lower rate base. The projected loss of rates revenue due to the expiry of the current SRV is estimated at $624,000 for the 2019/20 year. Council proposes to apply to retain the current SRV of 4.77%. Council also plans to request an additional one-off SRV of 4.23%. The total SRV application will be for a 9% increase in rates revenue (i.e. the current 4.77% SRV plus a new 4.23% SRV). The estimated 2.7% rate peg will also be added. The impact on ratepayers will be a new 4.23% SRV plus the rate peg. The projected total SRV income (from maintaining the current SRV plus adding the new SRV) is estimated at $1.178 million for the 2019/20 year. Importantly, the allocation of funding would be subject to legislatively required annual Service and Asset Management Plan reviews and to addressing priority risk mitigation actions. Expenditure would target critical service/ asset priorities that the community places a high value on and / or those that have a high risk profile. 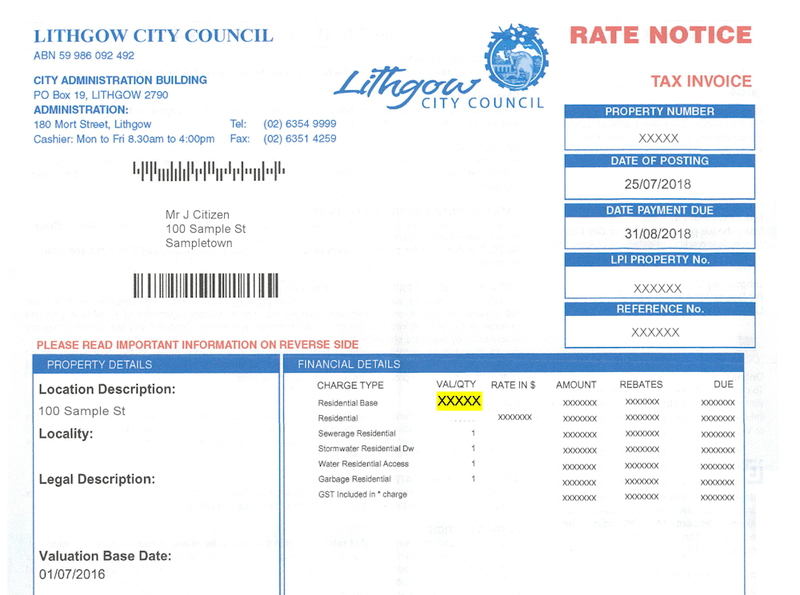 The Lithgow City Council Rates Calculator below provides ratepayers of the Lithgow LGA with the ability to assess the impact these two scenarios will have on their annual rates for 2019/20. To use the calculator you will need to know the valuation of your property that is set by the Valuer General. This value is based on the land value only and does not include any improvements such as buildings. The valuation of your property can be found in the financial details section of your rate notice. It is the first item in the VAL/QTY column as highlighted in yellow on the sample rates notice image provided. This rates calculator is only for the base property rates and does not include other charges such as waste, sewerage or water charges. What if I feel that I can’t afford to pay? Council acknowledges that any rate increase may adversely impact some community members. Council has a Hardship Policy and alternative payment options to assist ratepayers should they have difficulty keeping up with their rate payments. Please contact Council Administration Centre for further information regarding this on 6354 9999.